January 28, 2015 By Sandra 20 Comments This post may contain affiliate links. Read my disclosure policy here. I’m sure my kids aren’t the only ones that feel a little awkward passing out cards with hearts and X’s and O’s on them to their playground buddies and basketball teammates… at least I hope they aren’t the only ones. Can you tell both of my children are boys? We started making personalized Valentine’s Day cookies for my kid’s close friends and classmates when my oldest son was in third grade. A simple cookie with a simple name piped on it seemed to do the trick and help him get over his awkwardness so… the tradition stuck. We made them every year after that. The older the boys got, the more involved they became in the cookie making process and the more fun we had. 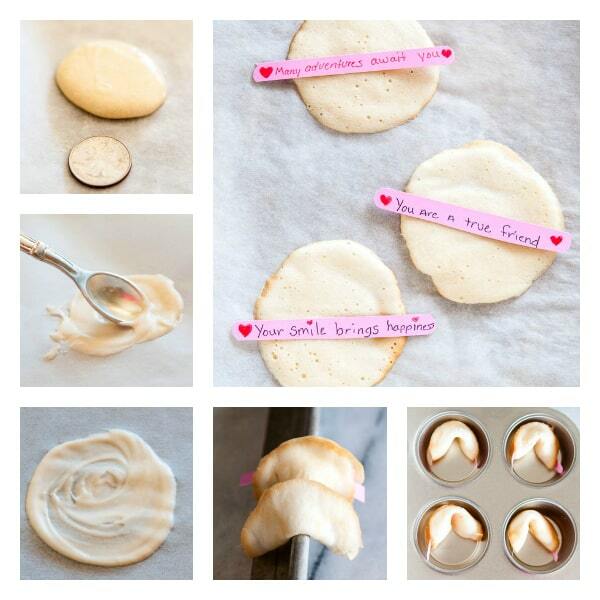 Cookie baking became a “quality time with Mom” thing every Valentine’s Day. When the boys got to high school, we started making homemade fortune cookies. At first, the fortunes were all about sports like, “You will score the winning basket.” And, “You will have fame and fortune.” Then, I challenged them to write a fortune that was personal for each of their friends and classmates. I thought I would get a little resistance or at least an “awww Mom!” But they actually enjoy coming up with something different specifically for each friend. First, take the chance to say something really special about each of your children. Have the fortunes written and cut out before you bake the cookies. The cookies cool off soooo fast that you won’t have time to do it when they come out of the oven. Start by baking 3 to 4 cookies at a time. They cool off very fast (I can only do 3 at a time). Plan on having some “cookie breakage” it will take you a a few minutes to get the hang of folding them. This is a large recipe so you should have plenty. Use the chocolate to patch any small cracks. Have your kids write and fold the fortunes but, unless they are older, they may not be able to fold the cookies fast enough. DO have the kids of all ages dip the cookie in chocolate and sprinkles! Have fun making these! If you have any questions at all, just leave a comment here on this post or come and find me at home on Everyday Southwest. You can also reach me on the Everyday Southwest Facebook Fan Page. Be sure to follow Kristina on Mother’s Niche Facebook Page so you won’t miss any of the fun happenings on Mother’s Niche! Write or print fortunes and cut them out. Fold the fortunes into narrow strips that are ¼ inch thick by about 2 inches long. Beat egg whites and sugar together on medium speed until just combined, about 1 minute. Sift flour and salt into egg white mixture and beat until combined, about 30 seconds. Add butter, milk and flavorings until combined. Prepare a baking sheet with parchment paper or silpat. If possible, do not use a dark, nonstick sheet pan, (the cookies will get too brown). Lightly spray parchment paper with nonstick cooking spray, optional (I do not spray mine). Spoon about 1 to 2 teaspoons of batter onto parchment paper or silpat for each cookie and spread into an even circle with the back of a spoon or small spatula. Start with only 3 cookies at a time. Bake for 7 minutes. Ovens vary in temperatures so, check at 6 minutes and bake until fortune cookie is set and slightly golden brown. Remove from oven and, working very quickly, flip cookies over, place a fortune across center of cookie and gently fold edges together to resemble a taco. Then, quickly fold "taco" over hot edge of pan to keep its shape while folding other cookies. Set folded cookies in a muffin tin to keep their shape while cooling. When all cookies are baked, place ½ cup of chocolate chips in a small bowl and melt in microwave by heating on 50 percent power for 15 seconds. Stir chocolate and repeat 4 to 5 more times or until chocolate is completely melted but not scorched. Stir remaining ¼ cup chocolate chips into hot, melted chocolate and stir until completely melted. Dip one side of each cookie into chocolate and then dip into colored sprinkles. Set aside for chocolate to set. Perfect idea! 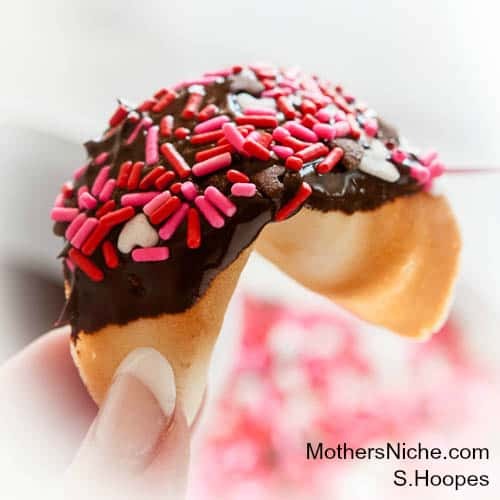 I love that you made fortune cookies from scratch! These are adorable and look tasty too! You really do take beautiful food pictures! These are SO fun! I cannot wait to try them, I didn’t realize they were so easy! These are too cute! I am going to have to try them with my son. Who would not like chocolate with a bit of encouragement. Love this idea! These fortune cookies are adorable! I love them right to pieces! You had a brilliant idea making personalized treats to help your boys avoid awkwardness. I’ll have to hang on to the thought for when my little guy gets in school. Such a pretty way to dress up fortune cookies! I cannot wait to make these! Such a bright, pretty presentation! What a great idea! We will try these. Totally pining these for later! Thanks for sharing! OH MY GOODNESS, I LOVE THIS! I am trying this immediately! Thank you sooo much for a unique idea for my loved ones! These are sooo cute! How perfect for Valentine’s Day, too! OH my gosh! My school PTA just brought these around to the teachers and they are delicious and so cute! Oh my goodness, this is such a cool idea!! I’ve never even thought to make my own personalized ones! Love it!